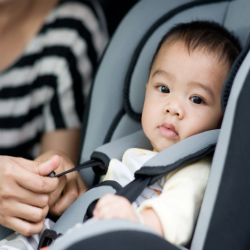 Are you sure that your children are secure in their car seats or booster seats? According to the Société d’assurance automobile du Québec, 2 out of 3 children are not safe while riding in a car. On June 1, 2012 MCH Trauma is partnering with the SPVM, SAAQ and the Canadian Tire Jumpstart Foundation in order to run a free car seat verification clinic. MCH Trauma specialists will be on hand to provide educational resources and consultations on car seat use as well as a large assortment of trauma and injury prevention topics. The SPVM will be verifying the car seats. Come join us for an informative and fun filled day and have your child’s car seat verified.